RIORI Vol. 2, Installment 18: JC Chandor’s “All Is Lost” (2013) | "Rent It Or Relent It"
A man stranded alone at sea faces having to a pilot leaky boat, cut off from the world thanks to failed radio contact and a ferocious storm as he struggles to survive with just a sextant, maritime maps and grim determination to guide him. When I was a pup, I went to this summer camp out on Cape Cod. When I say “out on Cape Cod,” I mean it. The place was on the fringe. You could see Ireland at daybreak, that’s what I mean. The camp, nestled on the coast as it was, was heavily into nautical activities. Swimming lessons were mandatory. But there were also less dire activities such as fishing and seining (look it up), even water skiing. There of course was boating, too. Sailing to be specific. You and three other crewmen, plus one seaworthy camp counselor could sail rings around the bay, literally learn the ropes and generally have a fine time just messing about with boats. An afternoon with sea spray, cresting waves and the wind in your face was bracing, as it was soothing with a sense of solitude out there on the sea (Okay, you could see land like a half-mile away, and technically you had other people with you. Just go with the metaphor. Trying to create atmosphere here, people). I also learned that actually steering a small boat can be a tense affair. Most of the time the counselor was at the tiller, steering our small vessel and tugging at the line like an old salt. Of course it was expected of his charges to pitch in and earn their hardtack and swill. All of us had to take the reigns eventually, and this scared the ever-lovin’ piss outta me. The bay was always windy. Always. There was virtually no slack to speak of when the tide was in. This made it an ideal place to learn how to sail; you’d never run out of fuel. Taking this into consideration, I learned a term I dread even to this day: capsize. I haven’t been on a boat, much less a small sloop in 20 years and still the notion of the thing just flipping over and sending me flying into the cold, unforgiving Massachusetts water freaks me out today. I’m telling you that thing to tell you this thing: the day came when it was my turn to take the tiller and learn how to “tack” the boat. For those not in the know, tacking is a maneuver by which a sailing vessel (which is sailing approximately into the wind) turns its bow through the wind so that the direction from which the wind blows changes from one side to the other. Its also called “coming about” in nautical parlance. In other words, I had to sail basically in and out of the wind, keep the boat on an even keel and make sure no one got their block knocked off by the swinging boom. I was like f*cking ten. I couldn’t steer a boat into the wind, let alone with other people on board. To say I was anxious is akin to saying the Atlantic Ocean is somewhat damp. So I protested. I was ten. We do that. The counselor on board was having none of it. Tacking is a very basic sailing move. You had to learn it to move goddam boat. I remember him clearly, Name of Willie. Scotsman. A for real Scotsman. He hailed from Glasgow and knew about sailing. Willie would not take no for an answer. He ordered me after a few words of confidence to get to work and shoved the tiller into my hand. What happened next? I think I pulled it off. I don’t really remember much with any clarity. All I can recall is that we didn’t capsize. That and Willie clapping me on the shoulder. I guess I had earned my sea legs (anyone want them back?). And that, ladies and germs, is my harrowing tale of life at sea. I know, I know. There was no real drama lives didn’t hang in balance. Just some dumb kid who basically learned how to steer left (sorry, port). But for the trivial nature of it all, I still found it harrowing, scary and exciting. I had mastered the sea. F*ck the seagulls. Today I am a man! I could go on with the synopsis but it would totally obliterate the story. All Is Lost is all about story, and Redford is story incarnate. There are a few basic tenets when writing fiction. One of which is you must have conflict to move the story forward. Second, you need to use a character in some form as a means to escalate and/or wrangle with the conflict. In Lost, we have our nameless hero smacked upside the head with conflict almost instantly. His boat is leaking. The sense of helplessness comes quick, as do the stakes. Instantly the story’s tension is reduced to a very primal conflict: survival or death. Good story! Redford is the avatar for that story. His simplicity is perfect for the audience to indentify with, climb on his back and take a piggyback. You are him for the next hour and a half, with no other cast mates to bog down the flow. It is the litmus test of the character-tension-conflict triad that makes story exist. Alright, enough of the literature lesson. All Is Lost was f*cking great. Tight, exciting and well acted. Redford had better be in good form since he’s the sole cast member. His facials and every move speak volumes. You can tell by how our hero handles himself and the events thrown at him in that he is a very experienced sailor and has seen it all, knowing what do to at every turn. No panicking, but it does loom throughout the film. In conveying this, Redford is solid. Lost’s pacing echoes the classic “adding the egg” metaphor. Hold on. I’ll explain. Back in the day, Betty Crocker was having a hard time selling its cake mixes (just follow me along with this). People complained that the stuff was too easy to make, just pop the box, add water and boom: mediocre pastry fun for the whole family No challenge there for yer brownie fix. So marketing tweaked the recipe. They added an extra step: add one egg. Shazam, the stuff sold like ice cream in hell. By adding the egg, it made the everyday housewife think they’re Wolfgang Puck. They now had a vested interest in the recipe working out. Lost is a very good example about when the director and/or actors leave out certain obvious plot points and the like, the audience will add their own “egg” and be more emotionally invested in the film. And boy, do we get an emotional investment, with stunning returns. We have non-stop tension throughout the run of the film. There’s almost a manic desperation to it. We see Redford get into one jam after another, seemingly solving one problem only have another come his way. Three steps forward, two steps back. The constant splashing of water mocks our hero, makes the audience empathize with our man. Redford aged 10 years over the course of the movie. But our man is unflinching in the midst of it all (SPOILER), even when his boat capsizes. It’s survival instinct personified. All Is Lost can be described simply has harrowing. This is one intense, utterly engrossing film that reduces the science of story to its base elements. The craft of storytelling is all about showing, not telling. With over 90 minutes of virtually no dialogue Lost had better be all about showing. And Redford showed how to act and keep the conflict alight, from the very first scene to right before the credits roll. With nary a word spoken. You can say a lot without saying anything sometimes. Is sailing by the jib symbolic of something? I learned how to sail a boat but not in a storm. Please leave any answers in the comments. I’m serious. The first rain scene, though brief, is beautiful. There’s no handle to manually work the bilge pump? Odd. The use of music here is haunting, probably because how sparsely it’s used. Auditory egg! I know I said last time I’d be bitchy, but my Netflix queue got all kerfuffled and went and sent me a quality movie. Although All Is Lost met The Standard on the diminishing returns factor, it just happened to be a film I actually wanted to see. But I’d be derelict in my duties to leave any film that hovers into my view unscathed. Sorry about that. Maybe next time I’ll get my britches in a bunch. For real. 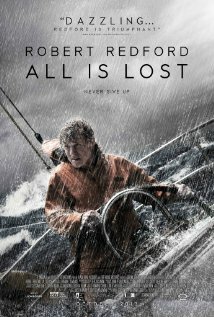 This entry was posted in Drama, Movies and tagged All Is Lost, JC Chandor, Robert Redford. Bookmark the permalink. Good review. The movie itself is fine, but it’s Redford who really pushes it over the edge. It’s a shame he wasn’t nominated for his work here, but I guess the field was just too tough this year in the Oscar race.